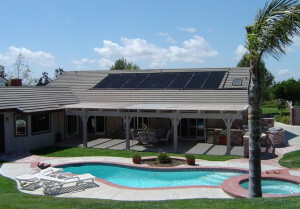 There are many reasons why people with pools should use solar pool panels. As everyone with a pool knows, it can be quite expensive to keep a warm and clean pool. Heating a pool can cost hundreds of dollars per month or more in many cooler areas. One of the best ways to lower this cost or even eliminate it is to install these specialized pool panels to take care of the heating. 1. Reduce or eliminate the need for a gas heater Solar pool panels use the energy from the light of the sun to heat the water and return it to the pool. In many areas of the country there is enough hot summer days to keep a pool warm enough to swim comfortably without ever having to use a gas powered heater. possible from a cost standpoint to keep the pool open longer. Even on colder days these panels can work to heat the water by capturing the energy from the sun and using it to provide consistent heat to the water. 3. Solar pool panels are easy to install Having the solar panels installed is much quicker and easier than most people think it will be. Since the solar panels are all pre-made and ready to be installed it can often be done in just a few hours. Whether they will be mounted on the rooftop of a house or perhaps that of the garage, or off to the side of the pool, they just need to be securely mounted and hooked up to the water pump. If the solar pool panels are mounted in a place which not close to the pump, the water tubes need to be buried or protected as well but that’s a simple job that won’t take too long either! 4. Add value to the pool and the home Installing solar pool panels is a great way to add additional value to the house and the pool. In the event that the home is sold in the future people will love the fact that it comes with a solar powered pool heater. This virtually eliminates the concern many people have when buying a home with a pool that it will be too expensive to run. Since they are designed to last for many years, this added value will be there no matter when the home is sold. Bottom Line Solar panels are not only a great way to get extra use and value from the pool while saving money but are a great investment into the home. Few things can provide the ongoing cost savings and higher home resell value while also improving the day to day use of the home like solar pool panels.